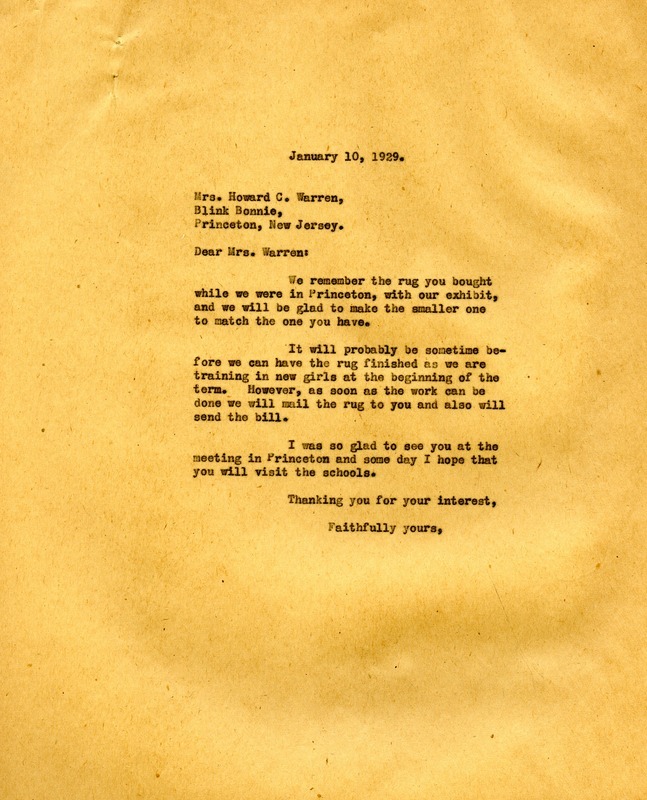 Letter to Mrs. Howard C. Warren from Martha Berry concerning a rug that Mrs. Warren bought while at one of Miss Berry's exhibits at Princeton. Miss Berry offers to have the smaller version of the same rug made by the girls but also concedes that it will take some time to reach her because they are training the new girls to weave. Martha Berry, “Letter to Mrs. Howard C. Warren from Martha Berry.” Martha Berry Digital Archive. Eds. Schlitz, Stephanie A., Haley Fortune , et al. Mount Berry: Berry College, 2013. accessed April 20, 2019, https://mbda.berry.edu/items/show/11259.